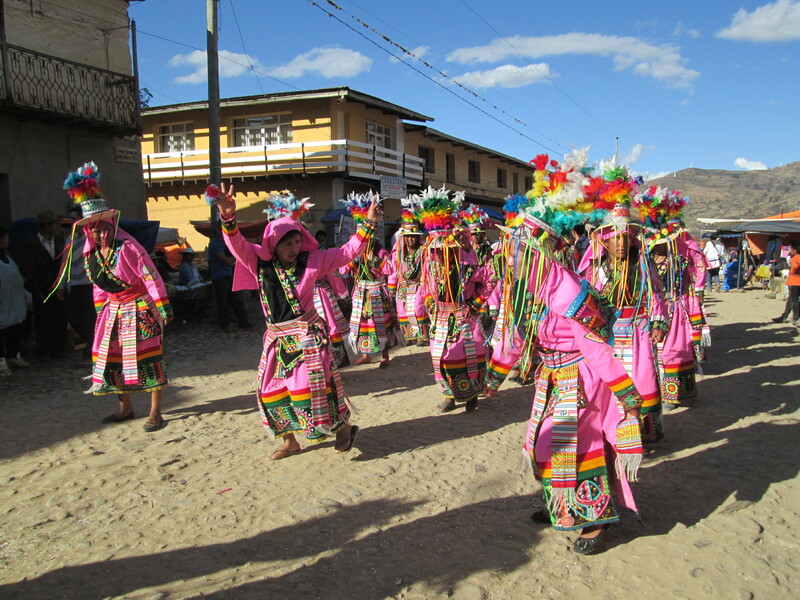 The first 3 weeks of July were the winter school vacation in Bolivia. Only 2 weeks had been scheduled but the cold temperatures made opening the unheated classrooms impractical. It was just as well because the 3rd week was the Fiesta del Virgen del Carmen, a 5 day party in the streets of Independencia. There were 6 folkloric dance fraternities this year, including both schools and school bands. Music, usually from multiple bands all playing something different went on almost 24 hours a day. 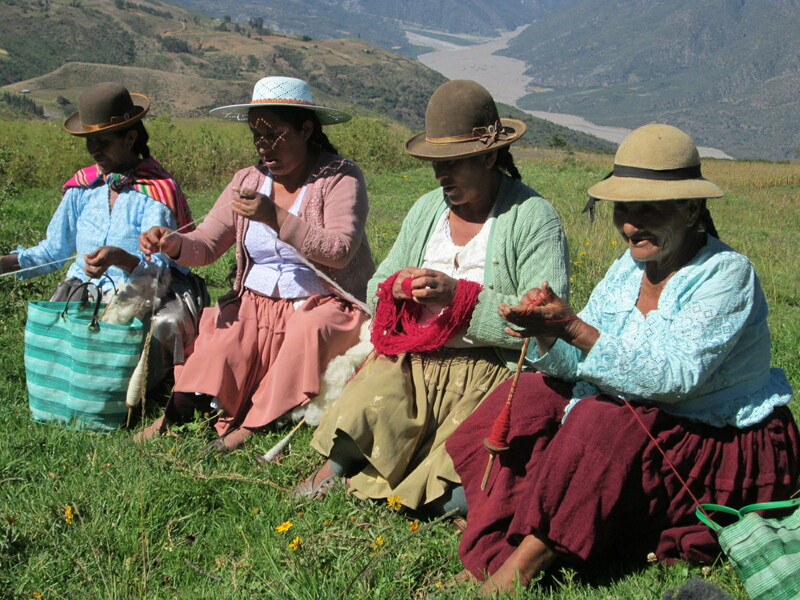 As wife of the mayor of Huancarani, Doña Máxima had 2 full days and nights of cooking and hosting responsibilities. Her 2 sisters and her daughter came from the city to help with the work. 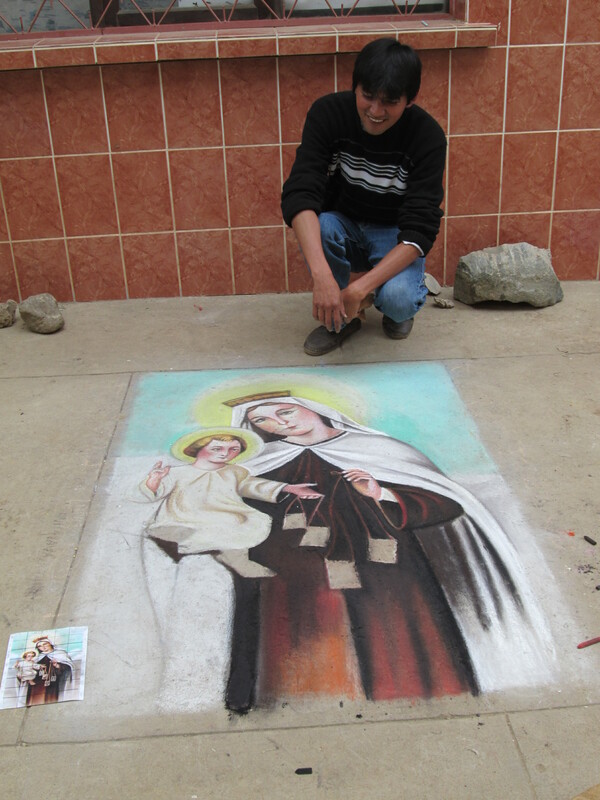 Volunteer, José Sánchez, a middle school teacher from Mexico, arrived mid-July wishing to introduce Madonnari, drawing on sidewalks with pastel chalk, to Independencia. 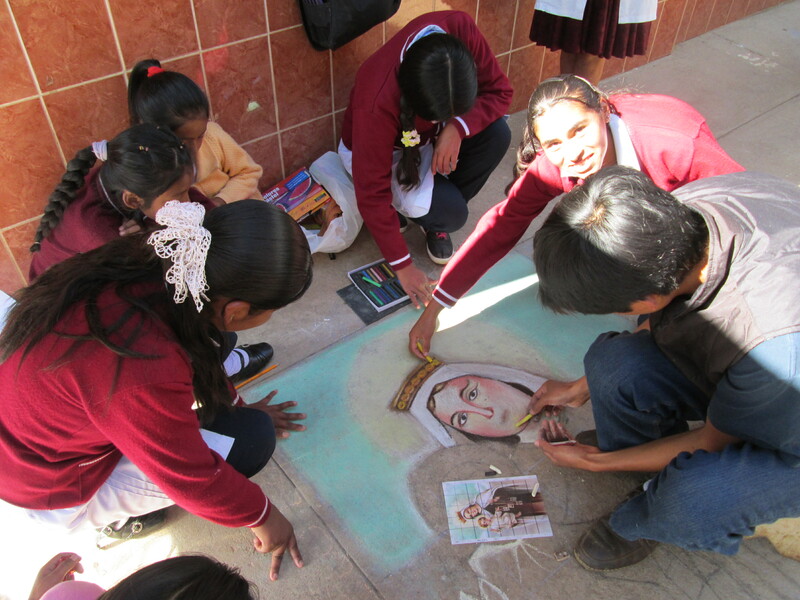 He participates in competitions in Mexico, and was very patient in responding to the most common question as to why he and the 3 chicas he taught at the Bolivian Alemán High School weren´t painting on a wall. The chicas chose an image of the Virgin de Carmen which they and José worked on for a week in the entrance to the high school. The following week they worked at the other high school with José to teach 2 interested chicas, who had selected a small image of the face of Don Bosco for whom their school is named.During his short stay José has become well known and receives enthusiastic greetings as he walks through town. 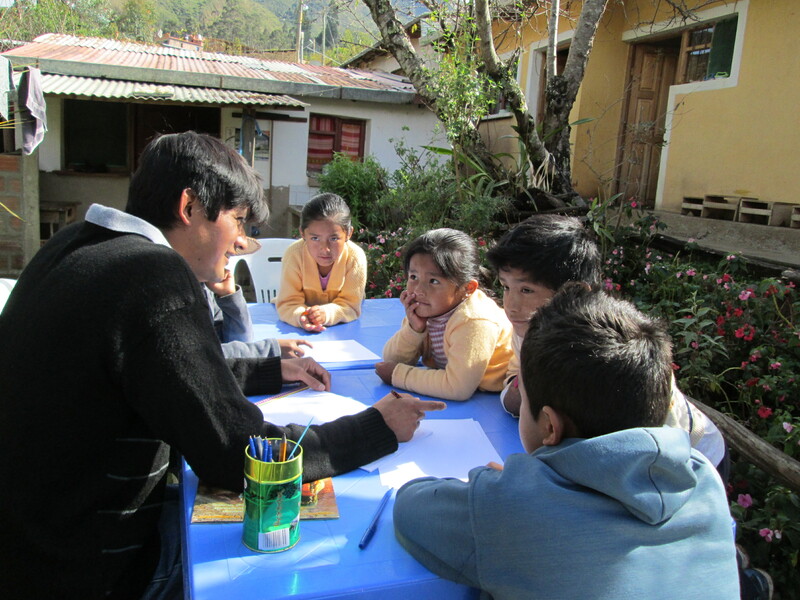 He graciously accepted a request from a high school teacher toassist the senior class in drawing and painting a large map of Bolivia. They will march it through the streets during the Independence Day parades on August 5th and 6th.The local teachers are frazzled as they attend to their duties of hosting the “Olympics”, which brought in thousands of students from 8 municipalities for 6 days of events during the last week of July. They know they also need to have their studentsprepared for the Independence Day celebration the following week. Nothing can be done while the classrooms serve as dormitories and the public spaces are lined with an army of local women cooking huge pots of food. Judy Richardson, the artist-in-residence for Sustainable Bolivia, arrivedlugging a backpack full of art supplieslate July for a 6 day visit. 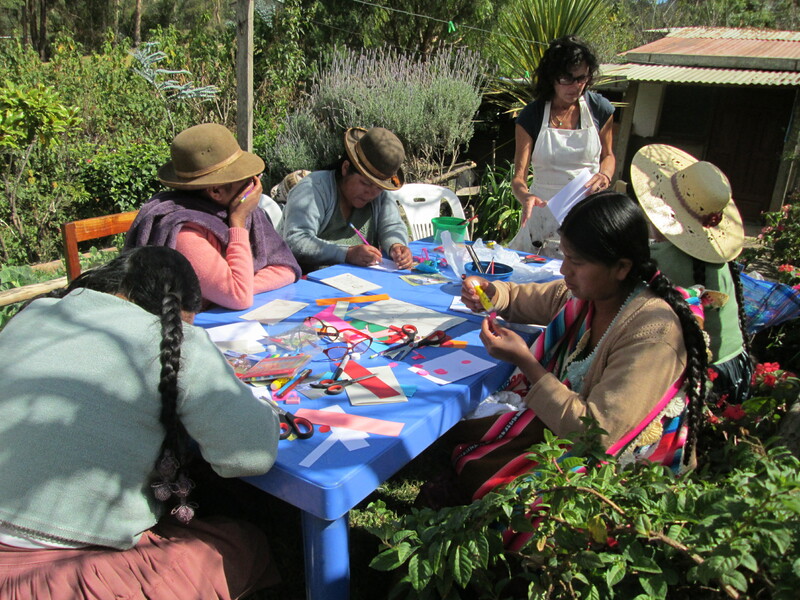 She found the Club de Artesanas (CdA) women initially resistant to drawing, but within an hour all were totally immersed in their work. There was much laughter during the puppet making class. Vilma´s 8 year old son who´s often in trouble at school flourished under Judy´s encouragement in drawing, puppet making, and mask making classes. 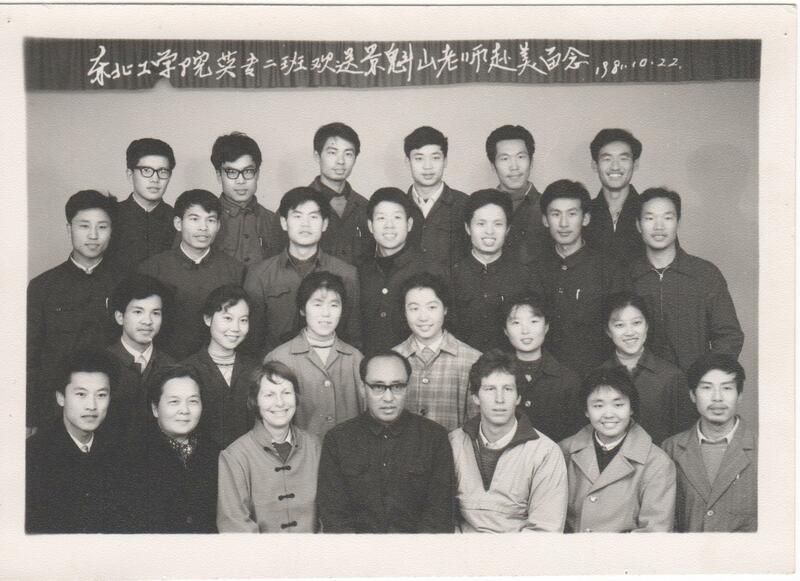 Both José and Judy worked with the kids of the CdA women and the CdA chicas. It was amazing to witness how engaged the kids can be with age appropriate learning activities. 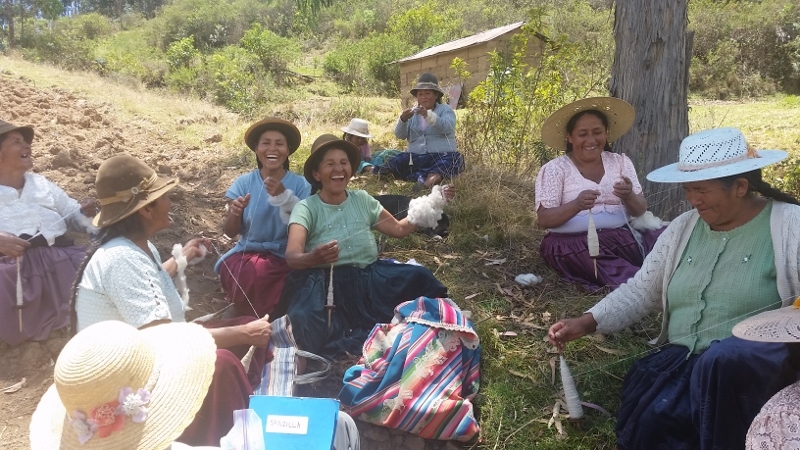 The volunteer program has lost momentum over the past year, and after these past few weeks it´s obvious that the technical assistance volunteers bring to this remote area is priceless. You will be noticing an increased effort to revive the program.